A 500 ml glass bottle. Carefully design. Attractive labeling. Generally expensive. This could be a brief description of a new generation of extra virgin olive oils (EVOO) that have emerged in the last four or five years. These EVOO are not yet extensively found in supermarkets but they can easily be found on gourmet shops. In the shelves, their appearance is attractive. They come in a nicely design and cool bottle, sometimes they even come in a gift box, but when you look to the price … you wonder: why should I pay twice the price of the EVOO that can be found in the supermarket? Aren’t they both extra virgin olive oils of similar qualities? May I be over paying just for the nicely design bottle and the case? Is this a marketing trick? Well, mostly no: the quality of both olive oils tends not to be the same. Below, we explain you why. First of all, that half-liter glass bottle of EVOO in the gourmet shop, carefully design, that replaces the crappy plastic one, will most likely contain early harvest extra virgin olive oil -also labeled as green oil or first day of harvest olive oil, etc. Under this denomination, the olives used to produce the EVOO were harvested when they were still green and were picked up before the fruit was fully mature. However, those EVOO most commonly found at the supermarket (that are cheaper), are generally extracted from fully ripe olives. This difference has important implication. Both oils are classified as EVOO as they both compliant with the standards that allow them to be labeled as such: but while mature oils are close to the legal limits, green oils handily exceed those minimum. In fact, both at the organoleptic (that is, flavor) as well as physico-chemically (those values analyzed in the laboratory), early harvest oils are clearly superior. When looking to their aroma and flavor, green olive oils are definitely more powerful (and are also more aromatic) and complex in the mouth (their taste evokes more things). They taste better and more intensively. Also, on the physical-chemical values – those that are analyzed in the laboratory and that constitute the second set of parameters to have into account to classify an olive oil as extra virgin -; green oils draw clear advantage. Its acidity is lower (the oil is a better starting point against their inevitable aging process), and the peroxide levels (that measures the degree of oxidation of the oils) as well. In conclusion, if you aspire to make quality olive oil early harvesting matters. It is that simple. But let’s continue digging. We’ve talked about the quality. Let’s see if that justifies the price. First, the performance that a green olive has, using the picual olive variety as reference, is around the 10-12%. That same olives if collected when fully ripe can reach a 25%. This means that when squeezing a green olive you get less than half of the juice you get with a fully ripe black olive. We have here one of the key factors that explain the difference in price. 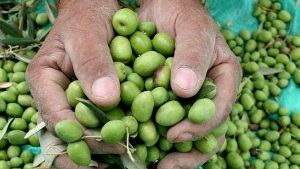 But there are many others: it is more expensive to collect green olives, their transportation is more delicate, and have more production wastage. But it is fair to say, yes, we might also be paying a bit more for things that are not exclusively link to its production. The packaging could one of them: the careful design, the high quality glass bottle, that tractive label… this all can increase the price as it happens for any other products and businesses. Another important aspect is the share of the market. These types of oils represent only a small share of it with low rotation. It still is a nascent market … perhaps in a few years this might change, but today, selling green oil means assuming that you will not sell massively. And that make the product more expensive, not just for the final price, but mainly on the production side (since it is not possible to apply economies of scale). 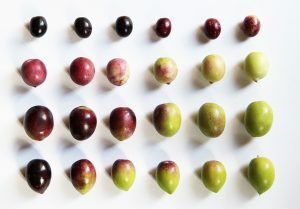 Different stages of ripeness on distinct olive varieties. Then, absolutely true, there are factors that can trigger the price which, in my humble opinion, respond more to marketing strategies and have little impact on the actual quality of the olive oil. For instance, aspect that have relative or not clearly documented effect on the quality of the oil such as using olives for trees thousands of years old, using hand-picked olives or olives only grounded into stone mills … And quasi esoteric differential factors such as olives collected in full moon nights, olives washed down with healing waters, or olives harvested by Carthusian monks hopping (the latter is a joke, but there are similar things out there). So, it is your choice. Green early harvested olive oils are a spectacular product. It is true that as many products called “gourmet” there could be some tricks. But in general, those olive oil producers that I know that focus on early harvest olive oils, make their EVOO thinking on what they would like to taste and enjoy. That is certainly the best guarantee for honesty in a product. As in everything in live, the key is to keep trying and find the early harvested EVOO that is right for your taste. And since you need to start with one, we voluntarily offer you Tierra Callada.